Ben reported his save the day after it happened. He was so kind to give us a short interview and the video of his save. CYPRES: Hello Ben, nice to meet you! Ben, tell us a little bit about yourself, where do you come from, what do you do, what are your interests? Ben: Hello, I am a police officer. I am married and father of two children and I’m also the vice president of the French National Police Parachute Association. I discovered skydiving in 2007, during a static line training course. I come from Normandy where I had a quiet life. Today, I live in Paris, a city that looks like a jungle. I have always loved extreme sports like snowboarding off-piste or scuba diving, a sport I discovered in Guadeloupe. CYPRES: Skydiving, how did you hit on that? How has your jumping career gone so far? How many jumps do you have so far? What do you prefer FS (RW), FF, …? Ben: I’ve always wanted to get high ;-), always did. One day at work, I discovered that a parachute associsation looked after sick people like me…. Crazies…. . So I participated in my first static line training. After I had made the experience of waiting, I was happy to get in the air. AND WHAT A TRIP!!!!!!!! I passed all my exams, but had to stay hungry because there was too much wind for the free fall. But I told myself everything was fine and that I would progress during the next training course. But – professional life tought me something else: I was leaving for Guadeloupe. 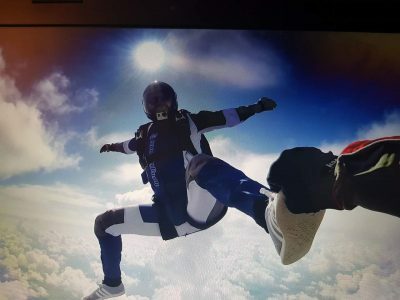 There I tried to improve my skydiving skills but the high prices and the working strikes, as well as the shut down of the skydiving center stopped me (I had two children I had to look after during this time). As soon as I returned to France I, got back in touch with the National Police Association and put the finger in it again: 15 jumps, then 40 then 70… to finish last years season with 100 jumps. I don’t have my own skydiving equipment. I rent it from a club. Last year they bought a superb vortex 2, made for me with a 210 squarefeet canopy that allowed me to skydive and learn to freefly…. I also love it. CYPRES: Had you ever heard of a CYPRES save in your acquaintance before? Ben: The CYPRES is part of our world. I had my C-licence last year and I knew about the system. CYPRES: How went the day before the save happened, was there anything special? What jump of the day was it? Did you have something special in mind? Ben: I can assure you that this was a normal police training course. We could not jump on the first day of training (total of 5 days). No alcohol and no woman ;-). CYPRES: Can you describe in detail about the jump and the CYPRES activation? 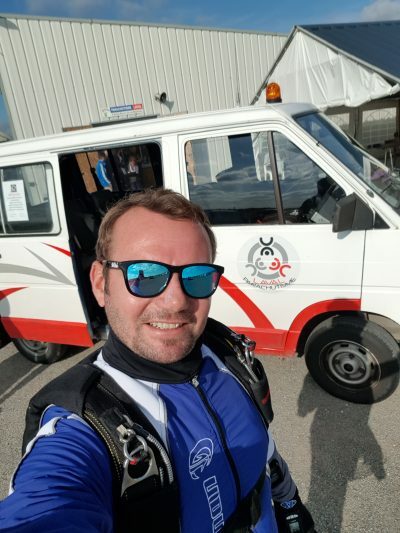 Ben: The jump went very well, I was with all my best friends from the Paraclub, very experienced people (1500 jumps minimum). I was just starting to spend some time with them in the air. After a good freefall, I drifted backwards and recovered. At 1000m, I tried to grab my handle but – nothing!! I couldn’t find it. Stress!! Then I tried to recover, but nothing!! I reached the handle with my fingertips, but nothing happened!! It was impossible to get it out. After trying three times, I didn’t know what to do…. I didn’t have the presence of mind doing my emergency procedure. Then it was too late to open my main canopy. The risk of opening too low and having a two canopy out scenario was too big. Something that had recently cost a dearly friend of mine six months and he is still in physiotherapy. I still hoped that the CYPRES would activate the reserve but I wasn’t expecting it anymore. “Waiting” for the impact, I looked at the hangar, wondering if someone was seeing what was happening to me. But nobody did. I then heard a “mechanical” noise in my back – then “BOOOOM”, the reserve opened.. Hooray!! CYPRES: The landing, do you remember what it felt like to land? Did you realize what had just happened? Ben: The reserve canopy opened. And then I realized I was alive! 14 seconds later, I safely landed on the ground. Oh my God!! CYPRES: How were the reactions from your friends at the dropzone? Ben: My friends who were in the jump didn’t really get it. We were the first group to leave the plane and seeing me land before them, with no main canopy released, confused them. The technical director of the dropzone was the only one who sawe me falling down to 220m. He knows me well, since I did almost all of my 250 jumps on this dropzone. CYPRES: Did you jump again that day? Ben: The technical director debriefed me and I jumped again 40 minutes later. I love skydiving so much that I was afraid to stay on this terrible frustration, the frustration of not having found my handle! I also jumped with the same equipment but we modified the handle. We put a ball on it. 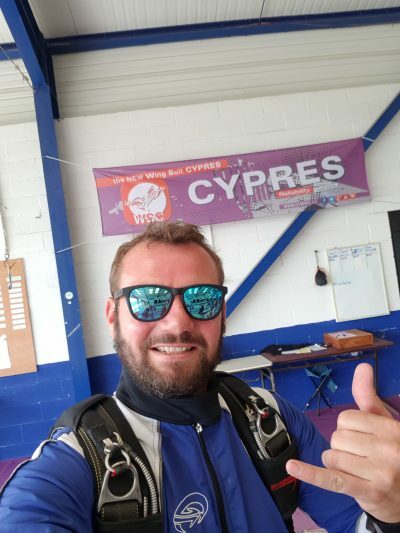 CYPRES: Since that day, did you change something in your routine before or during skydiving? Is there anything you’re looking at more than before? Ben: I changed and modified everything. As vice-president of my association, I want to raise awareness of the emergency procedure on all members, starting at the beginning of the season. Refresher training will be mandatory as well. Believe me, this experience will be good for everyone around me and from now on I will be the ambassador of your brand. Thanks for sharing your story Ben! See here all of our The day CYPRES saved my life save stories.